This letter was shared by a Friendly Center Apartments tenant. WILMINGTON — Some elderly residents and others have been informed that they’ll have to move out of their apartments and find other housing. But the company that operates the Friendly Center Apartments — the nonprofit Episcopal Retirement Services in Cincinnati — says they have a plan that is best for at least its older residents for the long-term. ERS operates Prairie Oaks Village in Wilmington with “219 affordable living efficiency, one- and two-bedroom apartments for qualifying residents that meet income requirements” at 290 Prairie Ave. — Friendly Center Apartments with 54 units — as well as the facilities at at 274 and 360 Prairie Ave., and at 445 S. Mulberry St. 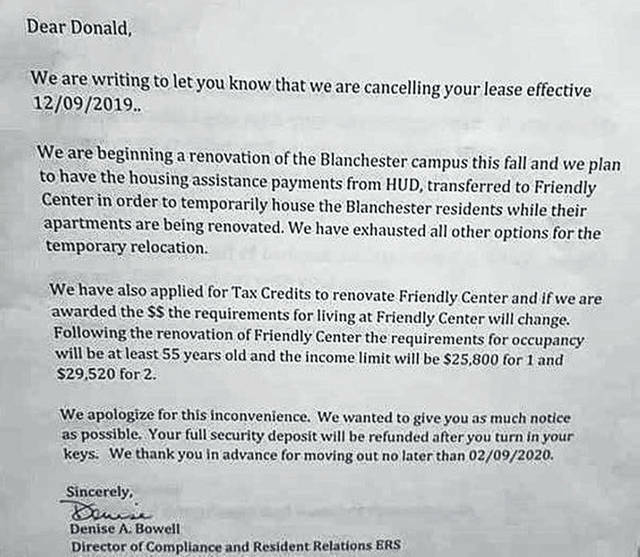 The News Journal was contacted by several people in the past few days about some elderly residents being informed by letter that they had four months to move out of their apartments. “We struggled and struggled with this decision,” said Kathy Ison-Lind, Vice President of Affordable Living and In-home Services for ERS. “There are three buildings there in Wilmington on that campus … each of the buildings on the end, Quaker and Prairie, are both HUD buildings. Friendly is not; it’s market rate, and has no restrictions in terms of age or income. And our mission is to serve low-income elders,” Ison-Lind explained. She said ERS has another property in Blanchester, which will be undergoing renovation, with 114 residents. “We have looked everywhere for relocation opportunities for them and there just isn’t anything around Blanchester that would be workable. “We talked to our HUD representative — who lives in Wilmington, loves Wilmington, loves these properties — if she would help us in any way. Because Friendly is market rate, she agreed (with us) and felt that would be our best option for relocating our Blanchester residents. “We’ve also put in an application to have the Friendly building renovated. It’s dated; it needs to be updated, and at that time if we do get the low-income housing tax credit, the tenant selection criteria for that building will change and it will be an elderly building that has income limitations. Ison-Lind estimates about half of Friendly’s residents are elderly. She said there are currently openings “in both Prairie and Quaker and we have asked those residents to please talk to our social workers and we will help them relocated — if they are age and income qualified … 62 or older and meet the income qualifications —we will help them move to Quaker and Prairie and we will pay for their moving expenses if they do qualify. Ison-Lind added that no leases are being broken — residents currently on a long-term lease can live at Friendly for the length of the lease; in some cases, that means they may live there into next year. The News Journal asked Ison-Lind what she message she has for family members of an elderly resident who has been asked to move. She added, “We’re quite experienced in juggling this process — in getting people to temporarily move out of locations while we’re doing renovations … we have the supports there to work with these folks. Donald Dimario, who is under age 62, moved into Friendly Center back in December. Four months later he received the letter asking him to leave when his lease is up next December. Dimario, along with other residents he said he spoke with, was surprised and baffled by this due to what seems like short notice. He also said the residents would be offered $200 to help move, but it wouldn’t be much help. While he doesn’t know what his next step is, he does hope to get other residents together and bring it forward to local officials to see what can be done. “I want to find answers to the lies, or what I think is lies and what other people think is lies,” he said. Jen Patrick, whose mother resides at Friendly Center hopes to find answers too. “Blanchester residents were told they were not displacing anyone and they were being moved into empty buildings and/or motel rooms,” she said. “Friendly Center told everyone last Thursday at the meeting that they had until August to get out, and when they had the meeting the letter was taped to the door a few days before, but mom showed me it wasn’t a mandatory meeting and it didn’t sound like it was going to be anything crazy like this. “Honestly, I thought it was about what they were going to do to upgrade or redo things like the greenhouse, because that’s what they had been talking about around there,” she said.